You probably know the story of how the Internet came to be and when it became popular, which were the first websites and so on. Nowadays we would like to assume that the Internet is already as it is: not only do we have simple websites, we also have e-commerce, social media and all the apps and smartphones. But it’s not complete yet. You probably have heard about a new emerging technology called the Blockchain. That mysterious thing that for newbies correlates with Bitcoin or with some hi-tech network and database structure. But it’s actually not that complicated. In fact, I think it’s going to be a core foundation of the Internet quite soon and the world is adapting it more and more. What has the beginning of 2018 brought to us in the world of Blockchain? We saw 2017 as a massive year for both Bitcoin (it increased almost 20%… until it fell). And for ICO-s and Ethereum, the latter being a Blockchain on top of most of ICO-s have been built. Most of them were scams because of not enough regulations. On 2018 we have seen loads of regulations coming in and with this, a lot of skepticism, bad press and media influence which have caused fear in newbie investors who have put their money in Bitcoin or other crypto-assets. But regulations are good, because they have weeded out already a lot of scams: Bitconnect is gone, Bittrex recently removed 82 tokens. Also, it gives way for legitimate businesses to actually build useful things on top of Blockchain. And already a lot of amazing things have been done. Looking at the market, many naysayers would say that blockchain is doomed or don’t understand why the prices are so low. I already mentioned the regulations, which have kicked the market down and for the long-term, it’s better. It’s not about whether the prices will skyrocket and how many people can buy a Lambo and when will the market fully crash, because… the whole thing is a ponzi scheme, right? It’s about the underlying technology behind blockchain and it promises to change the way we use money and online services and it goes far beyond online with ICO fundraisings to reach people around the world faster to help them build better future projects both in technology and outside of it (there are even a lot of environmental projects). So I am not talking about Bitcoin here. It’s difficult to predict if it will stick or something else like Bitcoin Cash will take over or not, but blockchain is here to stay if it won’t become overly regulated or the whales won’t crash the whole market. 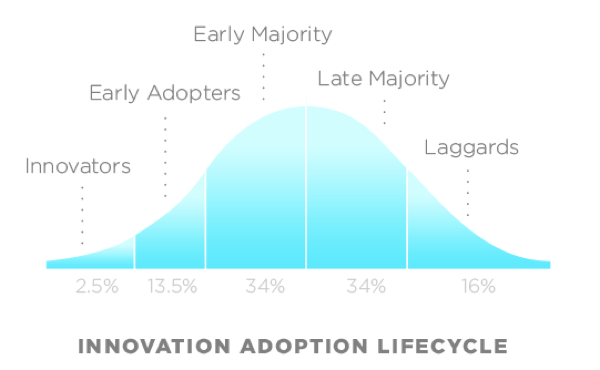 Where are we in the Adoption Cycle of Blockchain? What has also been a problem with blockchain projects is that those are still the early days and we are probably still in the middle of early adoption phase. There are still regulations and regulatory units that need to come up, but also there is lack of tools and all the information hasn’t reached to everyone yet. Most people are just beginning to get what Bitcoin is, while the rest of the market has been grown so much bigger. For example, one cool project is Blockchain Terminal which promises to give better tools for hedge funds. But what is Blockchain really? To put it simply, it’s like a public register. It’s meant for either storing or transferring data or sending and verifying transactions without intermediaries like banks. The information is verified by either mining, which means all computers connected into solving algorithms have a part in proving validity of the transactions (PoW — proof of work, e.g. Ethereum, Bitcoin) or by distributed consensus (PoS — proof of stake, NEO e.g. which is Ethereum’s Chinese version to put it very simply). But that is probably not enough of an explanation if you want to understand it properly. This video is so far the best explanation of how blockchain actually works while not being overly complicated. What’s the difference between Web 2.0 and Web3.0? What does it mean “Blockchain being the new Internet? It is simply a realization of web’s true power: decentralization and interconnectedness. It’s what Carlos Domingos from Spice VC said in an interview on Polycon 2018 that big players like Facebook or Google have taken much of the Internet’s power and opportunities to themselves. 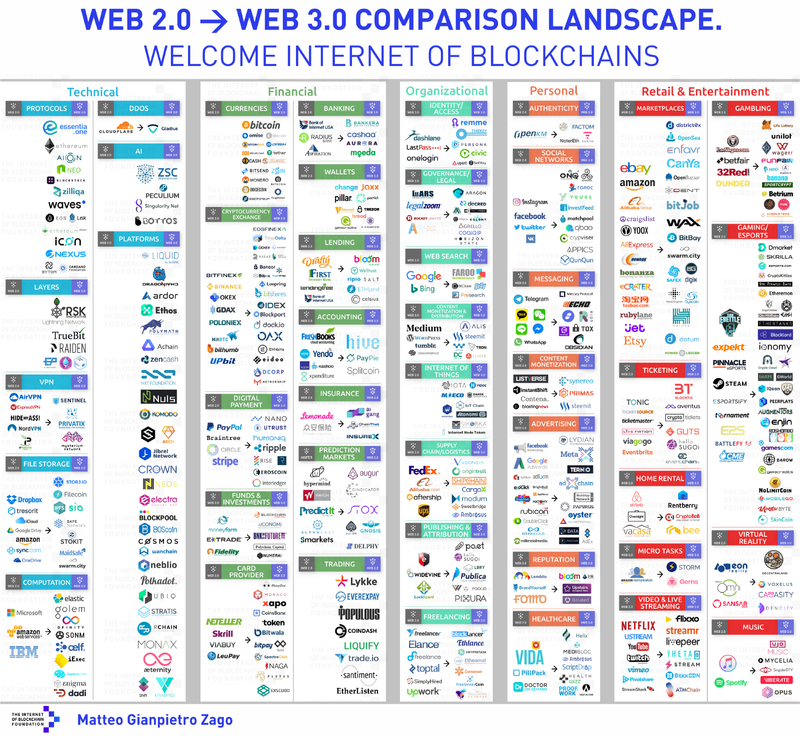 Also about what web 3.0 has been predicted to be: a system of different websites and apps that are interconnected and can exchange information with each other. Right now one of the closest examples from web 2.0 is Facebook: you can use it to login to sites, read the news there, find an apartment, even order pizza from messenger bots etc. But it’s just one app not connected to any other similar apps much. What if instead of protecting the data they own or selling it to other companies for profits, we would have the Internet of companies that are free and you don’t have to worry about whether Facebook is selling your data, listening to your phone calls or etc? And you wouldn’t have to wait for international or even national bank transfers to take 24 hours or even days or weeks? Imagine instant transfers, no more delays in payments, lower transfer fees, being able to enjoy being a freelancer wherever in the world and having no boss, investing in index funds and startups without a hassle, having smaller fees in whatever online service you use. Those are just some of the things that blockchain can change and the list goes on and on from watching movies online to investing in startups via Venture Capital. Let us know what do you think down in the comments! Well, we kind of agree that blockchain is the future. We don’t agree, however, if we can afford such energy waste to proof of work, or to be exact proof of trust. There is no blockchain advantage without decentralization, and most of listed giants simply don’t need any decentralized solution, because they have enough resources for all technical challenges they face. Great question is… Do the giants must be dethroned? I mean, really taken down to make way and space to the revolution and new kind of organizations, decentralized and even maybe turquoise?